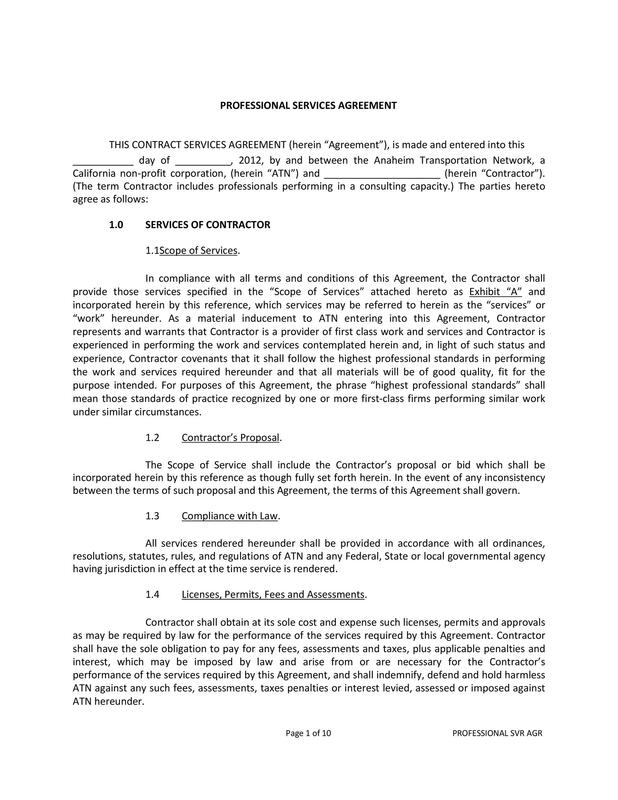 A service agreement is a contract signed between a contractor (internal or external service provider) and the client/end user, which outlines the level of services that the client expects from the service provider. 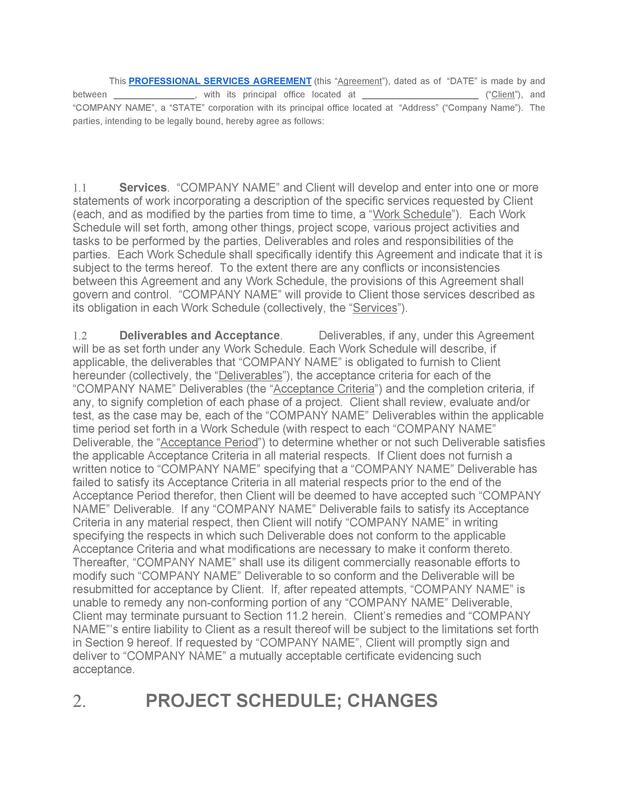 Any service agreement template will be heavily output-based, in the sense that they essentially outline what the client expects as results when the project is complete. 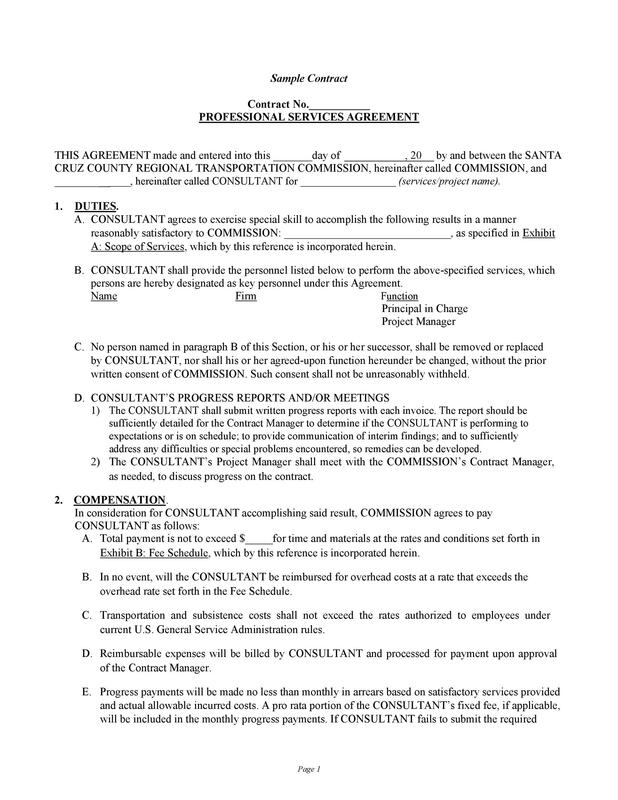 3 Why do I need a service agreement? 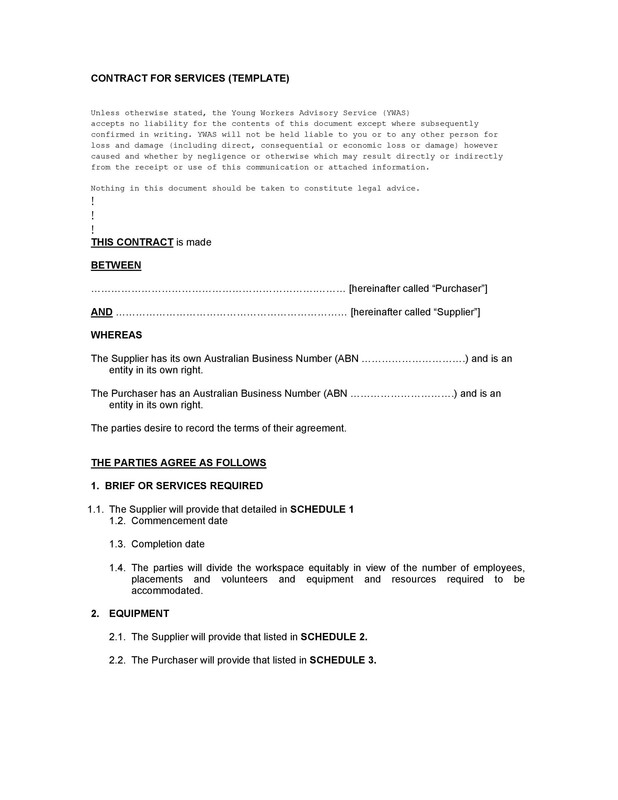 8 Who should prepare the service agreement? They describe the service(s) that are to be rendered by the contractor. In the IT industry, this could be something like domain name servers, network connectivity, and configuration of protocol servers. The agreement should indicate how often the service will be running (uptime) and the possibility of outages, and how often they can be expected. There should be a set limit for the outages. The service needs to be responsive once it has been rolled out on the client’s end. The service provider must be punctual, especially with respect to the response requests. The contractor must also indicate the dates of which there will be scheduled maintenance, and the ramifications of such – will the entire system be offline? Will certain services be unavailable? There should be an outlined procedure for reporting problems as and when they arise. This should also include protocols. Who should the user get in touch with in the event of a problem? How will these problems be reported? What is the outlined procedure for escalating problems, and what are the steps that need to be taken in order to efficiently resolve these problems? The services must be monitored. There should be clear guidelines on the individual tasked with monitoring the performance of the system. There should also be an indication of how often the performance will be reviewed, and more importantly, the amount of access or limits to which the customer has to the performance statistics. What happens when the service obligations are not met? In most cases, this is usually solved in the form of reimbursements or some form of credit to the client. 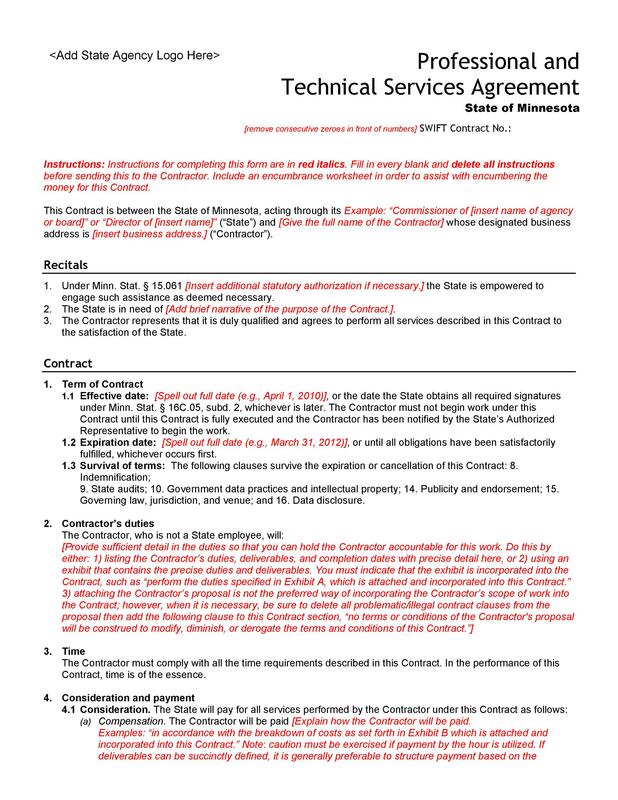 Under extreme circumstances, the client reserves the right to terminate the contract with the contractor, and there should be an outline on the liberties that either of the parties forfeits upon the immature termination of the contract. 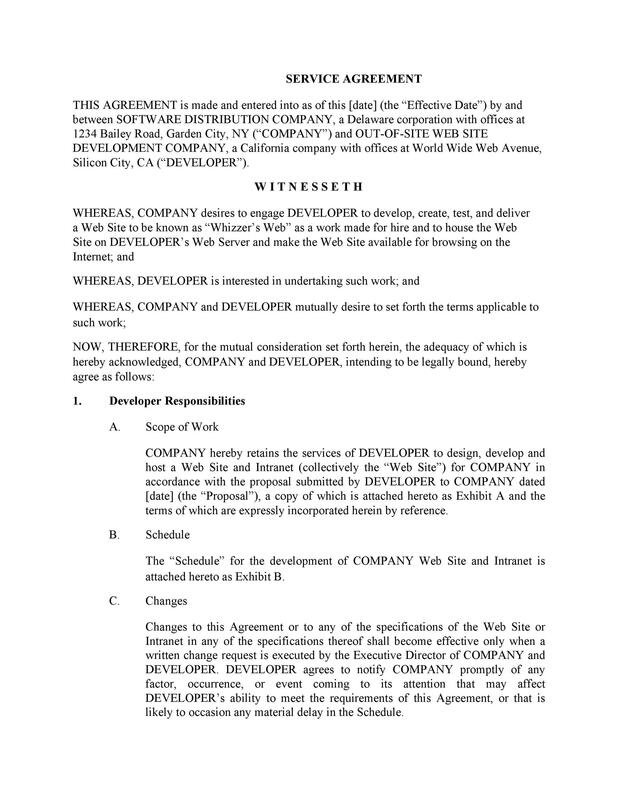 In any service agreement, there is usually an escape clause. 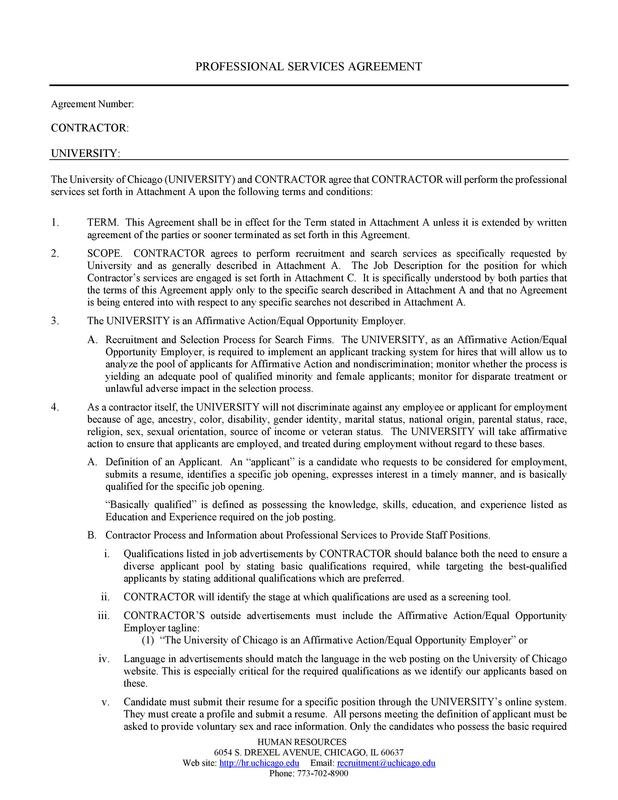 This underlines situations where the services that are guaranteed in the agreement are unattainable, and nothing can be done by either party to the contract to see things through. This usually covers situations where natural events affect the routine service delivery, like flooding. 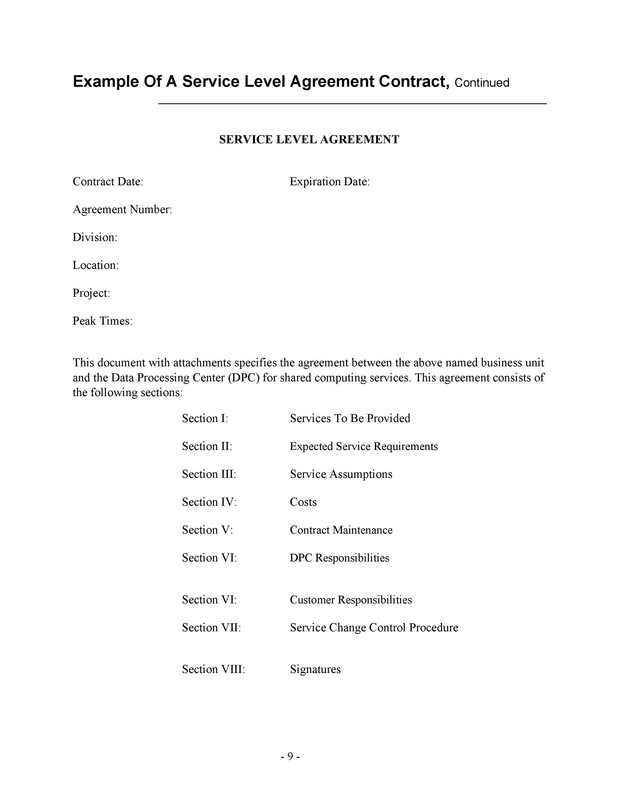 Depending on the service provider, the service agreement metrics usually vary. However, most of these agreement metrics will generally cover the same things, like the quality and volume of work, the responsiveness and speed, and efficiency within which the services will be rendered. There is, however, a major emphasis on the precision and accuracy of service delivery. 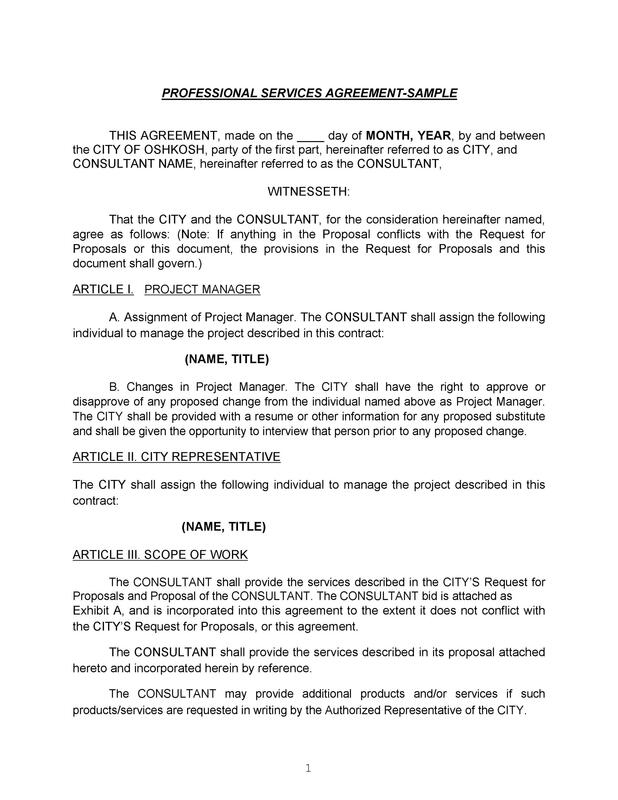 Through this, therefore, the agreement establishes a mutual understanding between the client and the contractor, of the services being rendered, the responsibilities of either party, the areas that are of high priority, warranties and guarantees that the service provider offers the client. 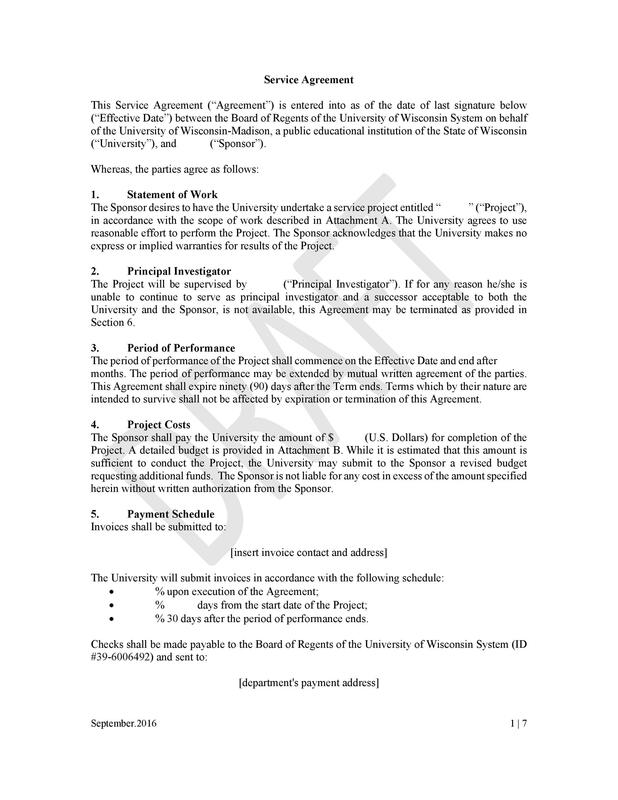 In the process of determining and assigning roles to the different performance metrics, the service agreement is also supposed to have a plan wherein challenges experienced in the course of service delivery are addressed. 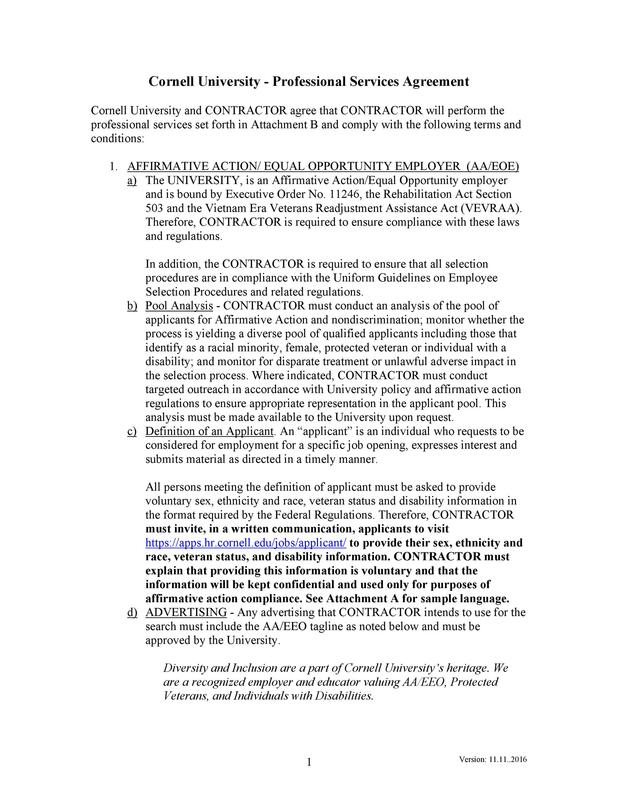 More importantly, what happens if there is a breach of contract? 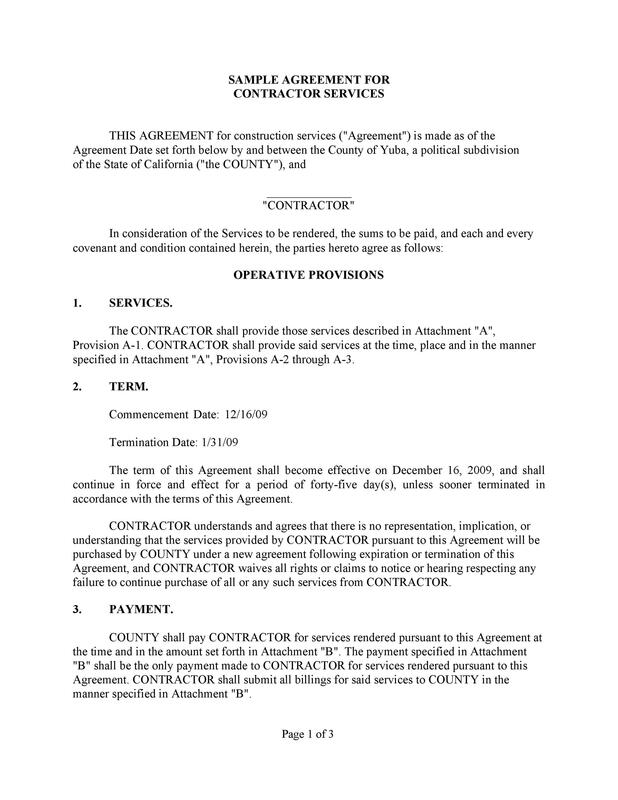 In most cases, contractors offer service credits as remedy for any breach of contract. 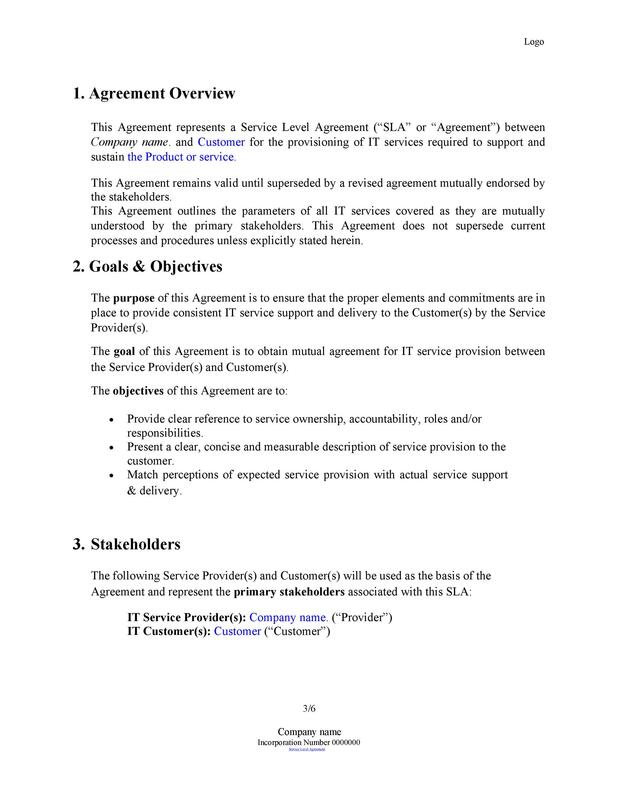 In this case, the service provider will actually offer services to the client depending on the calculations arising out of the service agreement. The most common option for providers is to provide commensurate claims to the client with respect to the amount of time that they would have exceeded depending on the performance guarantee on the service agreement. For example, assuming that the network in your business goes down for one hour, your service provider might be compelled to provide a 10% rebate on your network service fees for the month, and so forth, whichever you agree on. 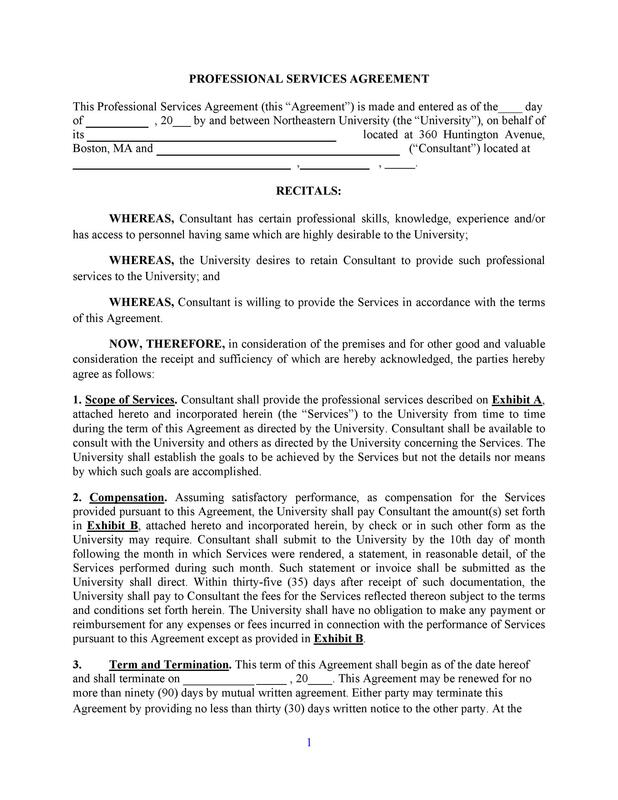 In this professional services agreement template, there should also be a section that addresses any exclusions in the service agreement. 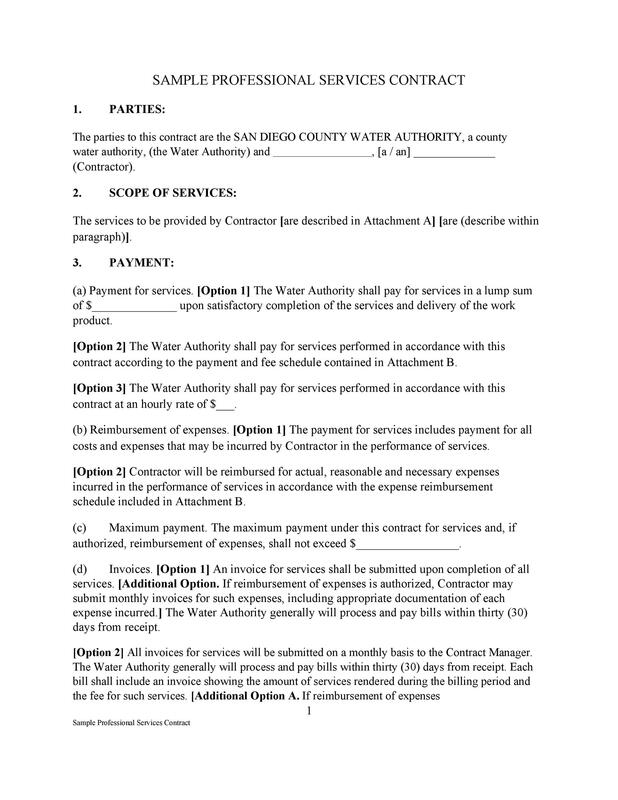 This refers to any situation where the guarantees in the service agreement and the penalties that are rendered when these guarantees are not met, do not apply. 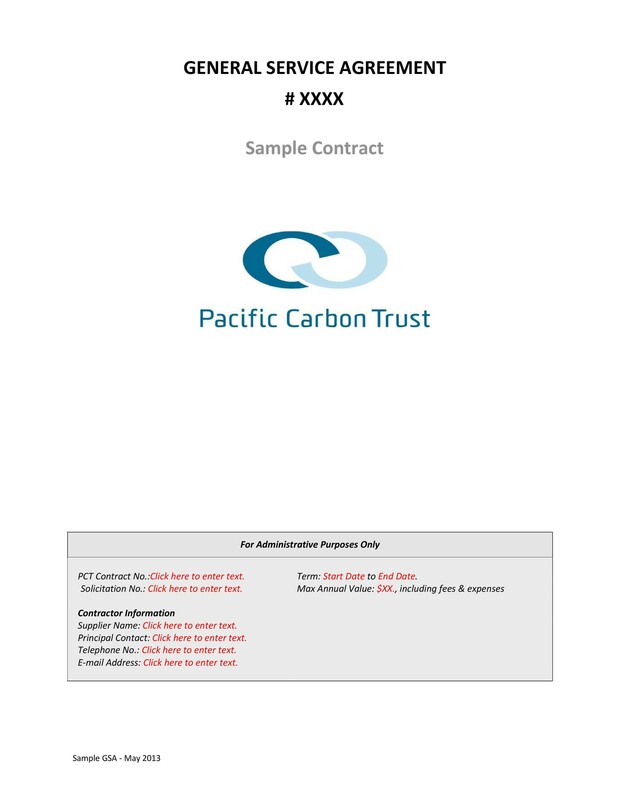 In most sales agreements, this will include things like terrorist attacks or natural disasters. This is the segment that you will find in most documents outlined under the force majeure clause, wherein the service provider is excused from taking on liabilities arising out of events that are beyond their control. 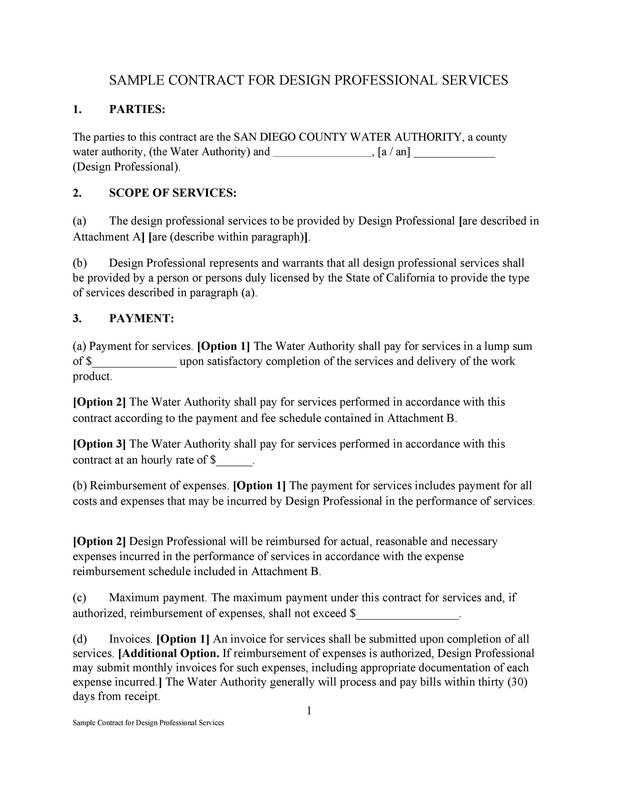 Who really needs a service agreement? 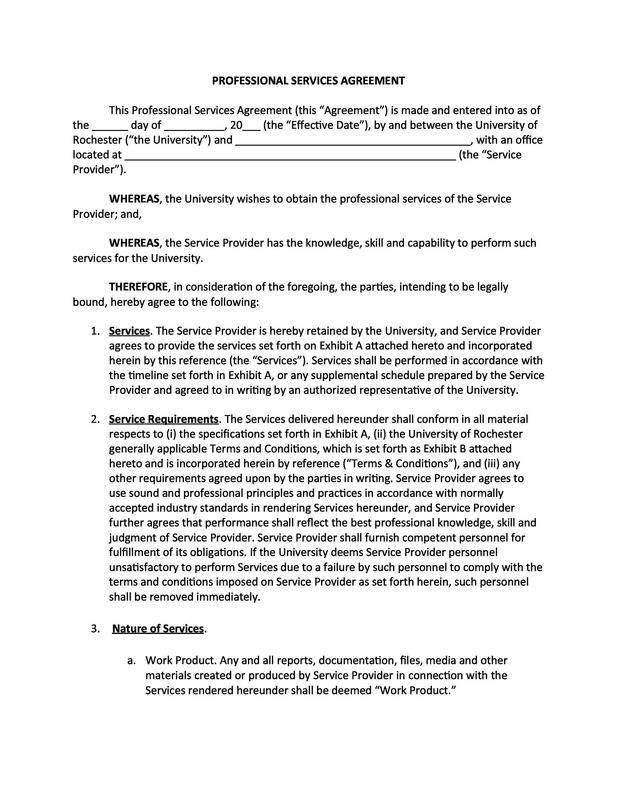 There are so many people who believe service agreements are only party to network and IT related fields, but technically, any service related industry requires these agreements. 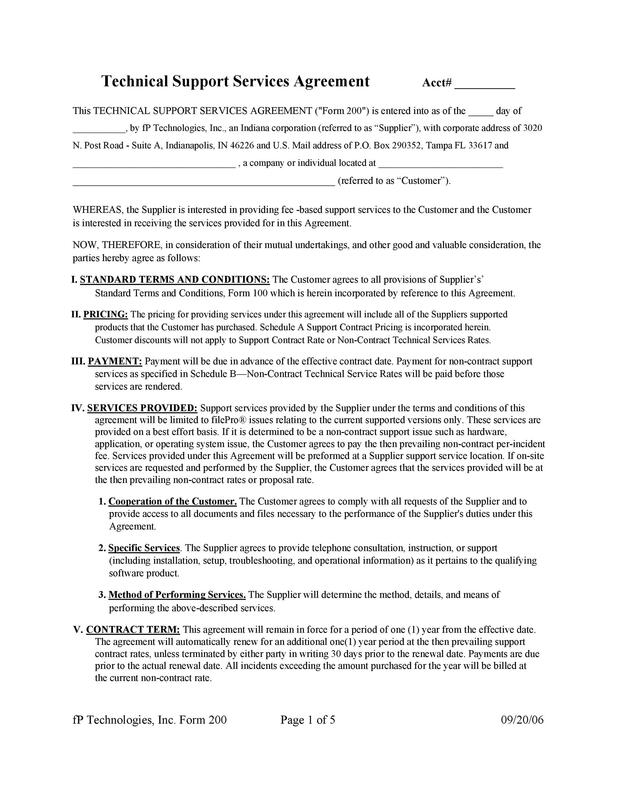 Companies or clients that have invested heavily on technology will most certainly need service agreements. This is important to make sure that any of the services that are rendered can be accurately measured and justified. It is also a good way for the client to compare the services they are receiving from the contractor with the services that other outsourcing vendors are providing in the market. It is a very good benchmarking tool. 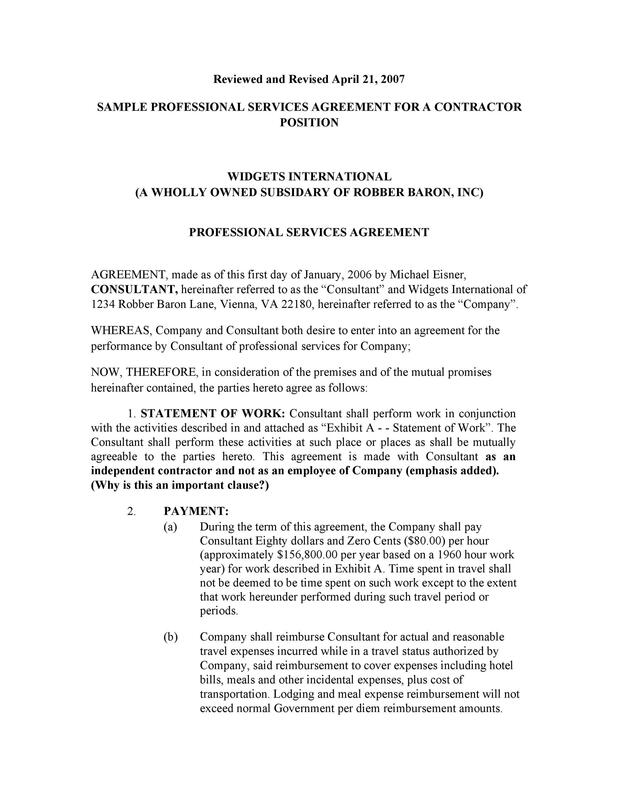 With a service agreement in place, it is impossible or very difficult for either of the parties involved in your contract to feign ignorance in the event that the agreement does not hold out. 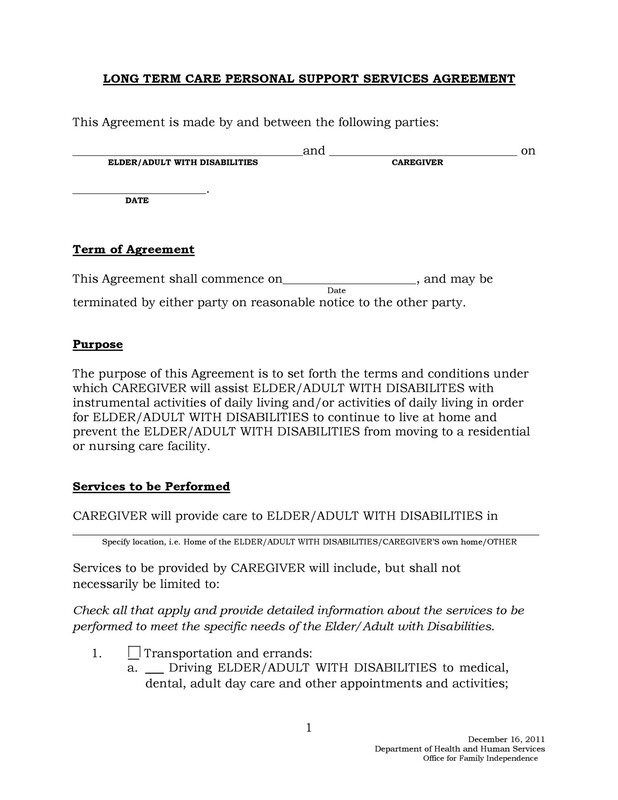 It is also wise to have these agreements looked into by legal counsel before you sign anything, or before you make plans for additional redress, like arbitration if all else fails. 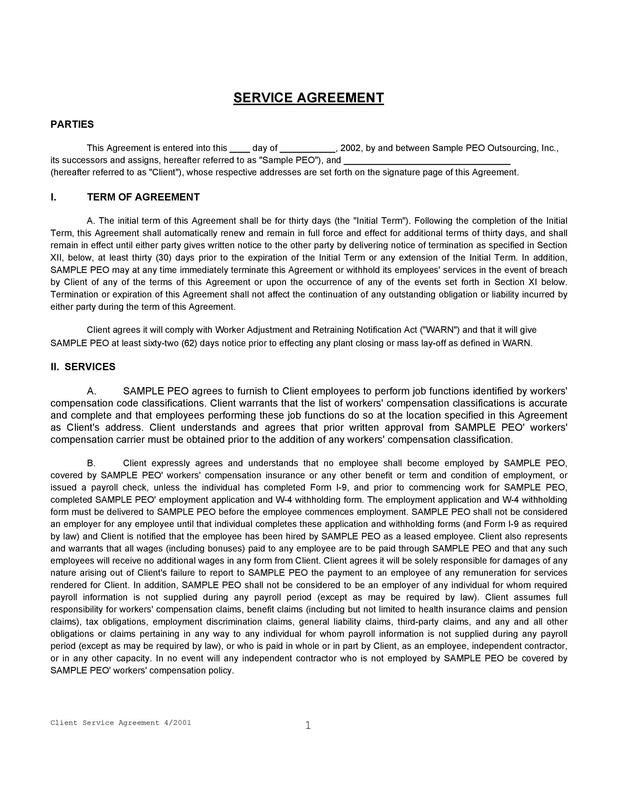 Service providers these days rely heavily on these agreements, and for a good reason. 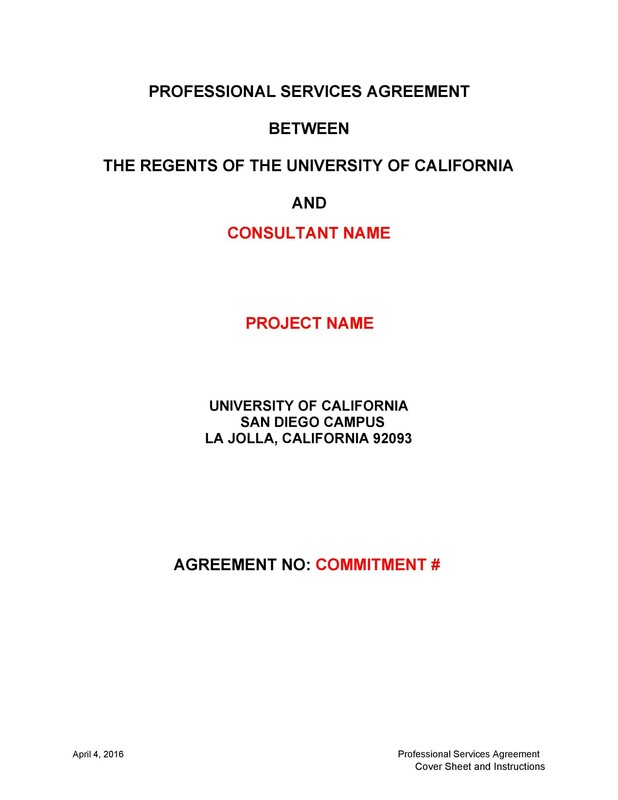 These agreements come in handy in an attempt to manage customer expectations, and more importantly, to define and determine the situations where the contractor is not liable for any performance related concerns arising from the client’s end. 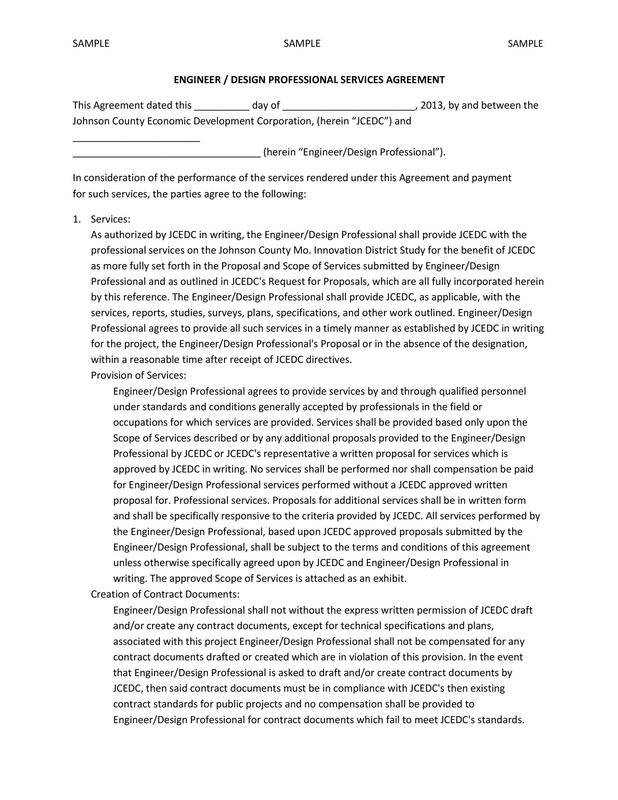 On the part of the client, they can also benefit from these agreements because they get to define the ideal characteristics of the services that they need from the contractor. This provides them a good way of seeking redress if things do not go according to plan. 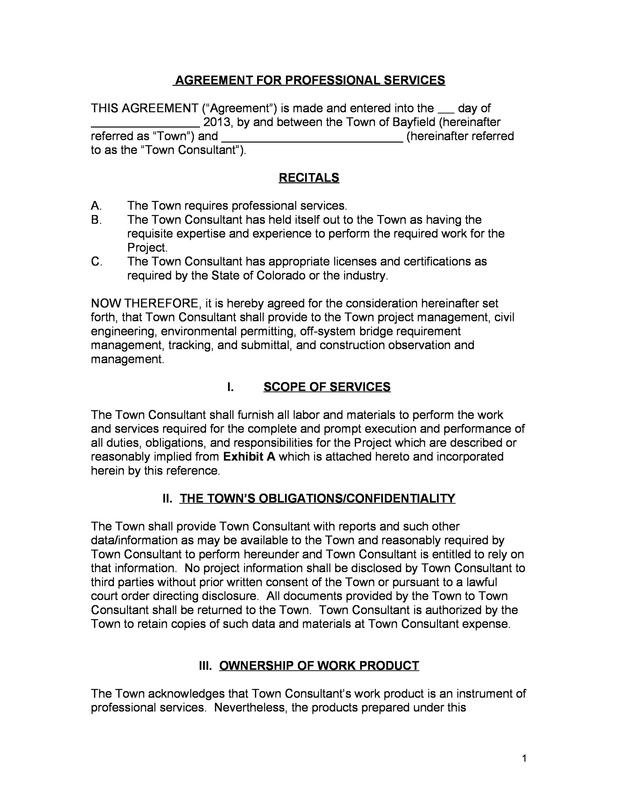 Contractors have two fundamental agreements with their clients, and the service agreement is one of these. 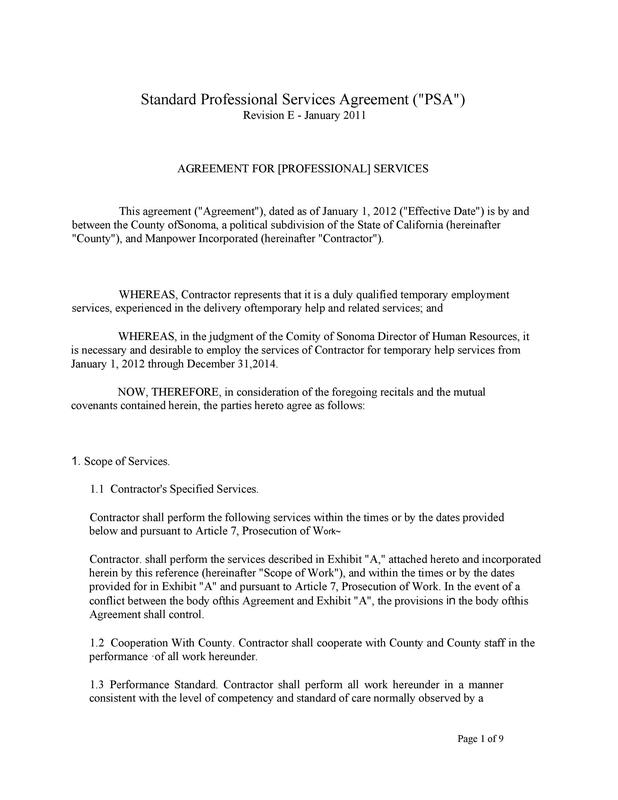 The second is the master service agreement. 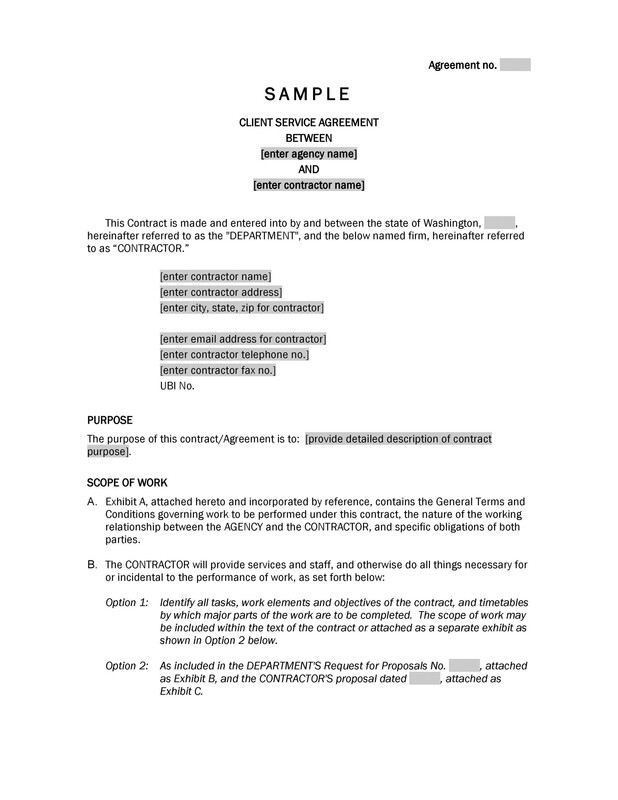 The master service agreement outlines the general terms and conditions within which the contractor will work with the clients. 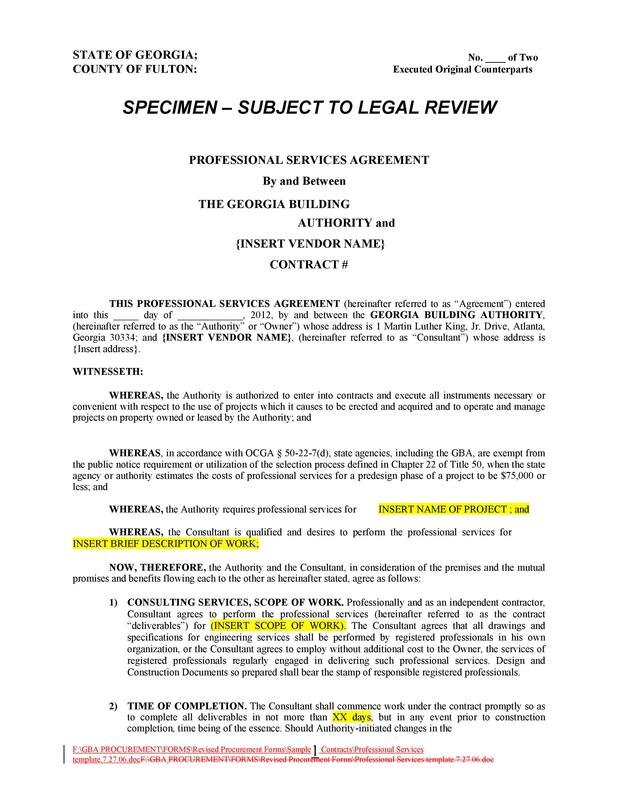 The service agreement, on the other hand, will in most cases be inducted into the master service agreement. It is important because it adds an element of specificity with respect to the services that are rendered, and outlines the metrics that will be put in place to measure performance. 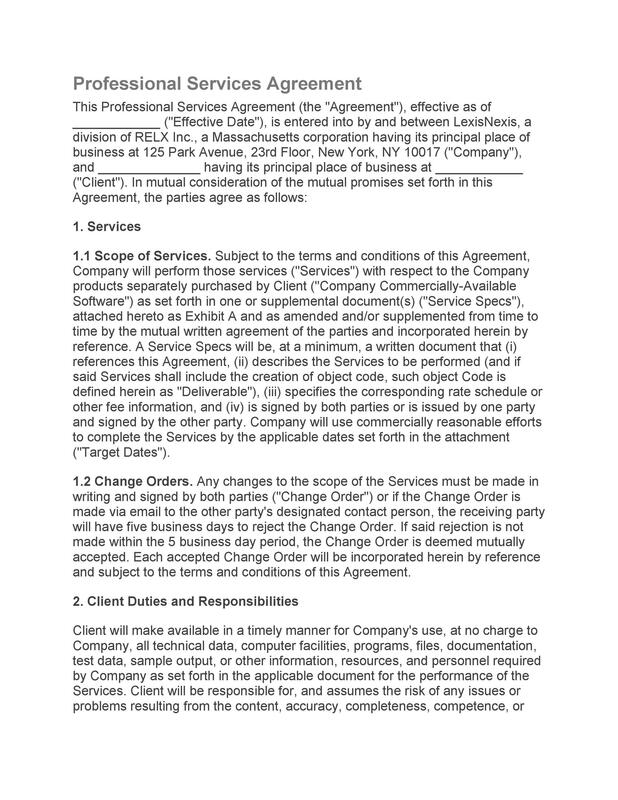 Service agreements have evolved over the years, and are currently a common phenomenon in the IT industry. 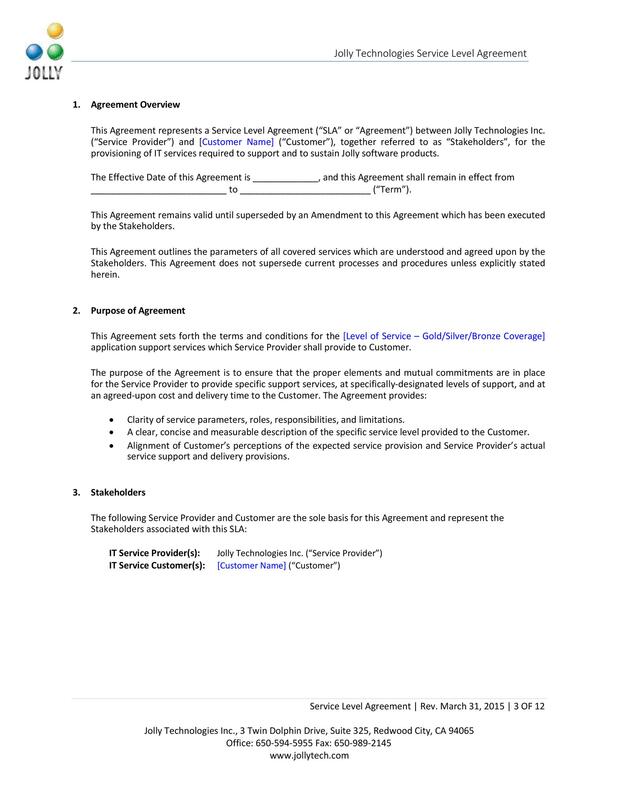 Over the years, these agreements have been considered a way of governing relationships between service providers and clients, especially with the emergence and thrift of outsourcing. They set the guidelines and expectations required of the service provider, and the set penalties if the contractor fails to meet their target. In some cases, bonuses are outlined for customers, which they get when they exceed their targets. 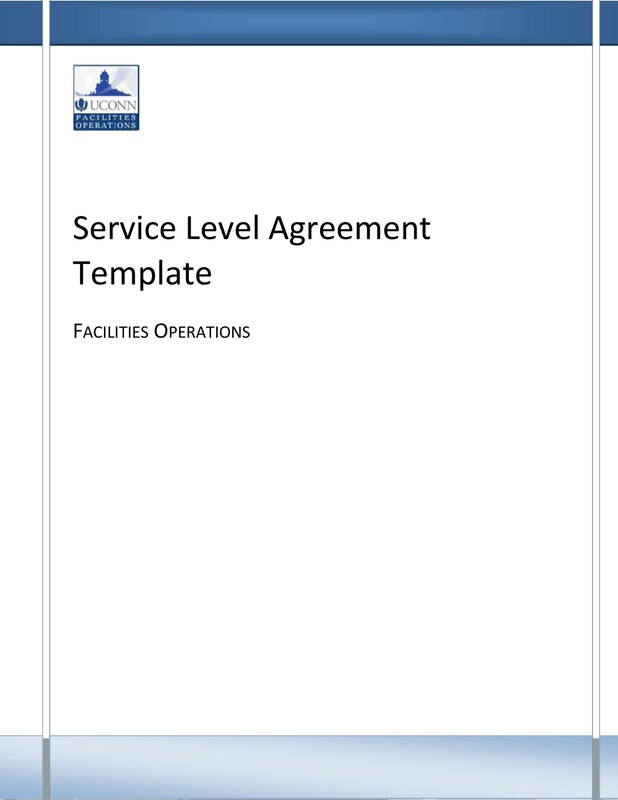 Because these service level agreement templates are usually customized for each customer, they are usually drafted for a specific project. 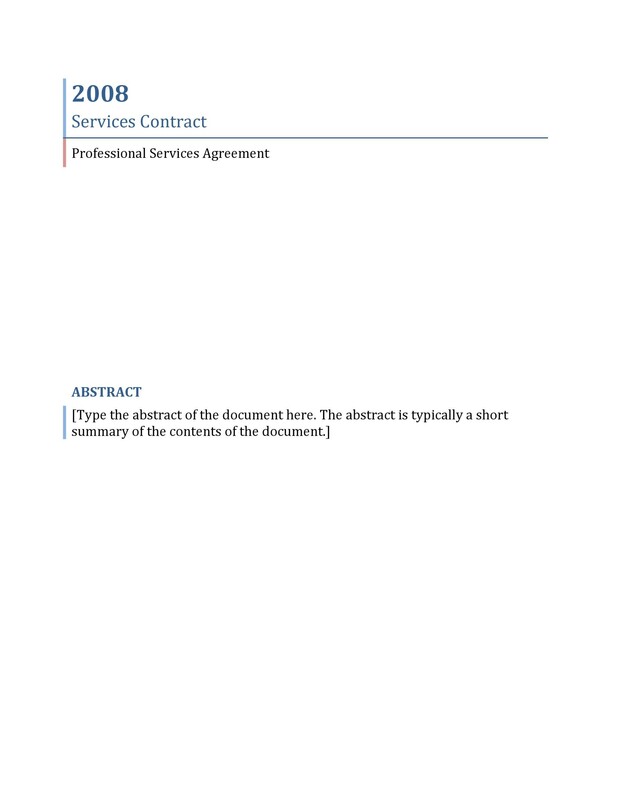 The specificity of a service agreement, especially the definition of its scope, is supposed to be unique and measurable in every segment where they are applied. This is important because it allows for proper benchmarking of the service qualities, and in case it is indicated in the agreement, penalized or rewards accorded. 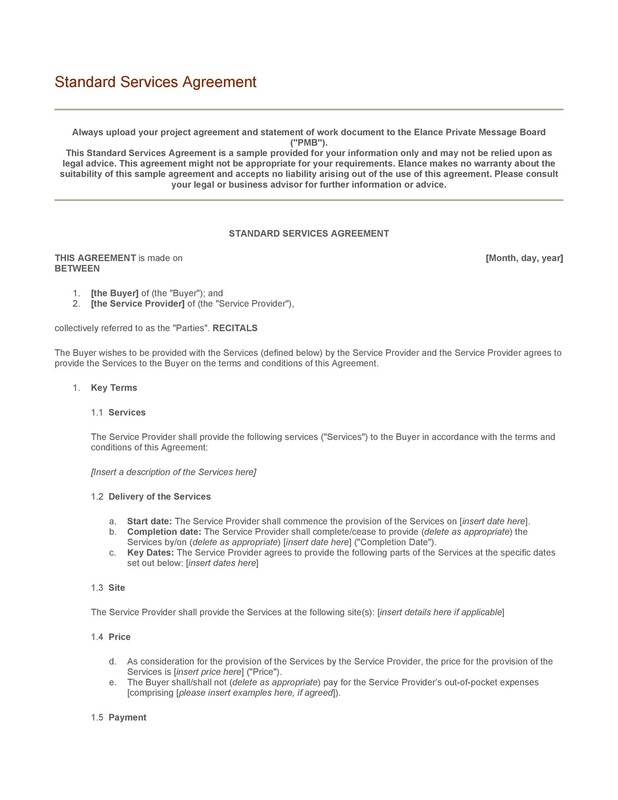 In order to prevent you from unsavory situations when your services are interrupted and you cannot seem to find a quick or reasonable reprieve, you should understand what is important in a service agreement, and why you need one. 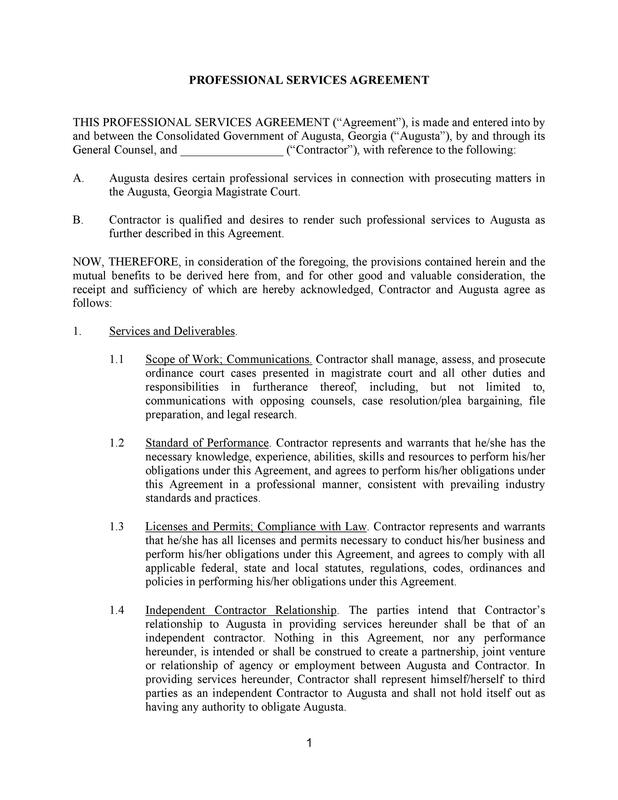 These agreements simply outline the responsibility of each party to whichever service being rendered to you, and how they classify and resolve any problem you have. 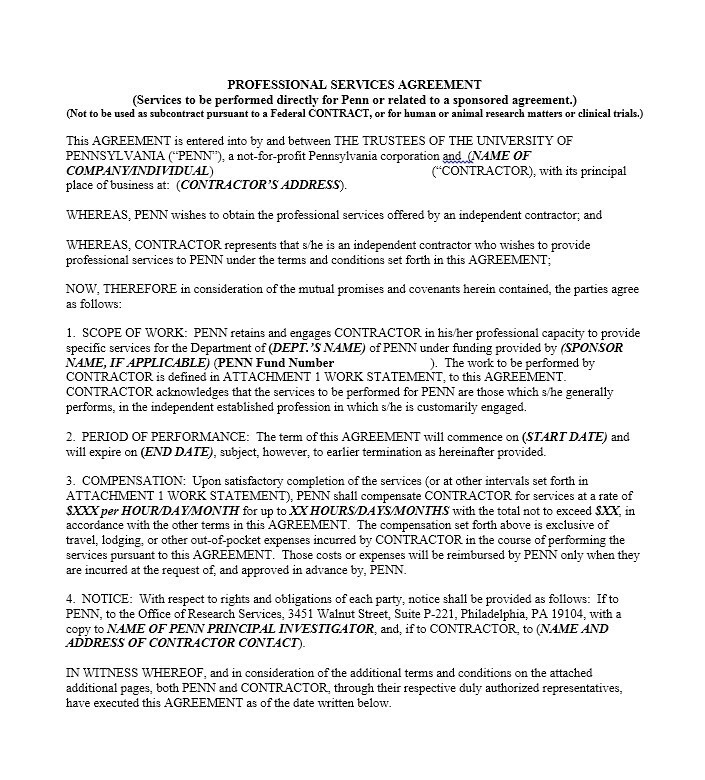 There are some contractors who have a one-size-fits-all mechanism for their service agreements, while others have unique agreements for different clients. Do I have an agreement with each contractor? 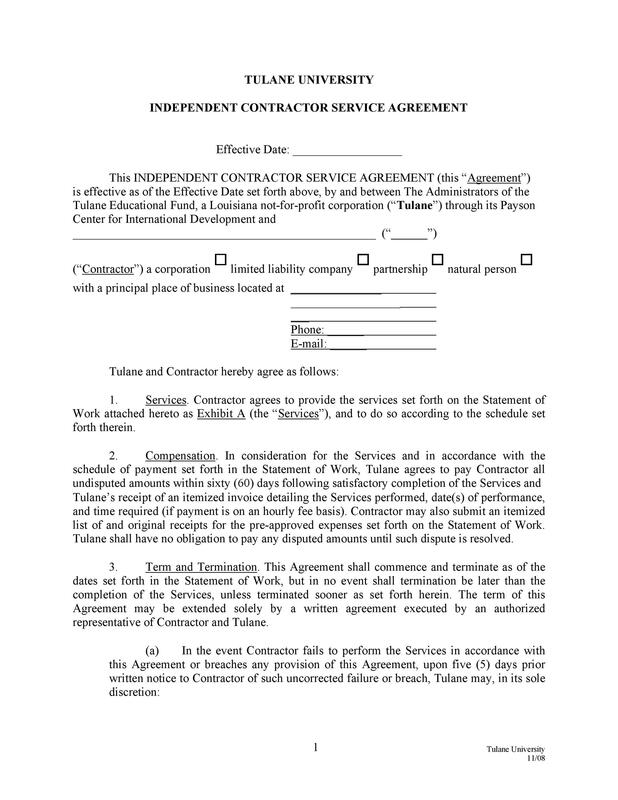 You do need to have these professional services agreement templates with every single contractor. In case you are not aware, get in touch with them and find out whether or not one is in place. In case you realize that your contractor does not have any service agreement with you, it might be a good time for you to start looking for a new contractor. 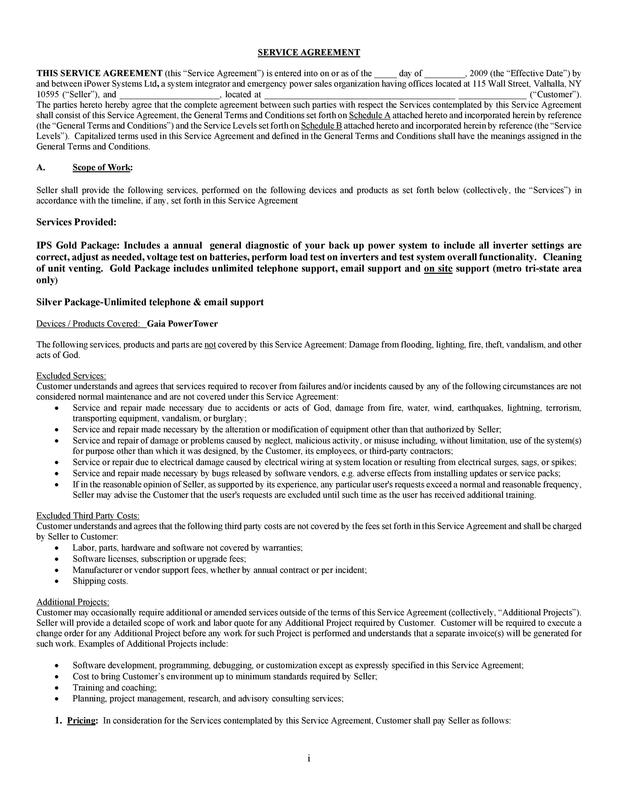 Can you find the service agreement? 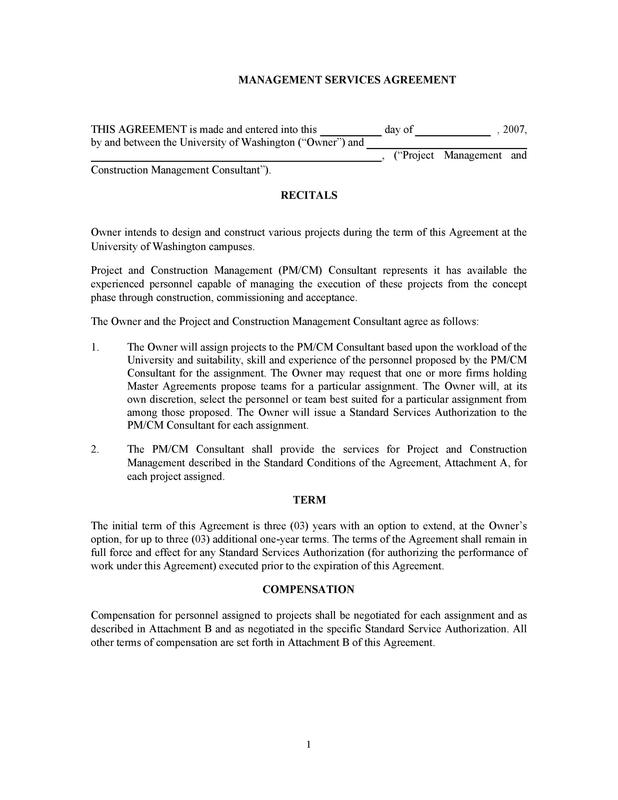 In case you cannot find the agreement you have with your contractor anywhere, you should get in touch with them as soon as possible and request a new copy. 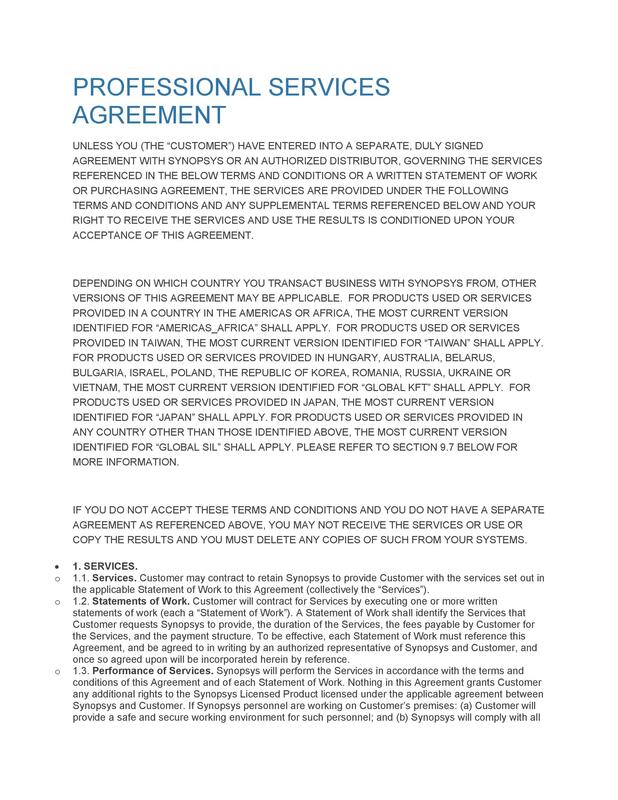 The agreement is supposed to be in a place where you can access it on demand. For your business, it is like a fire extinguisher. You might not need it all the time, but when the need arises, you should know where it is and access it so fast. What terms govern the agreement? This is about needs assessment. 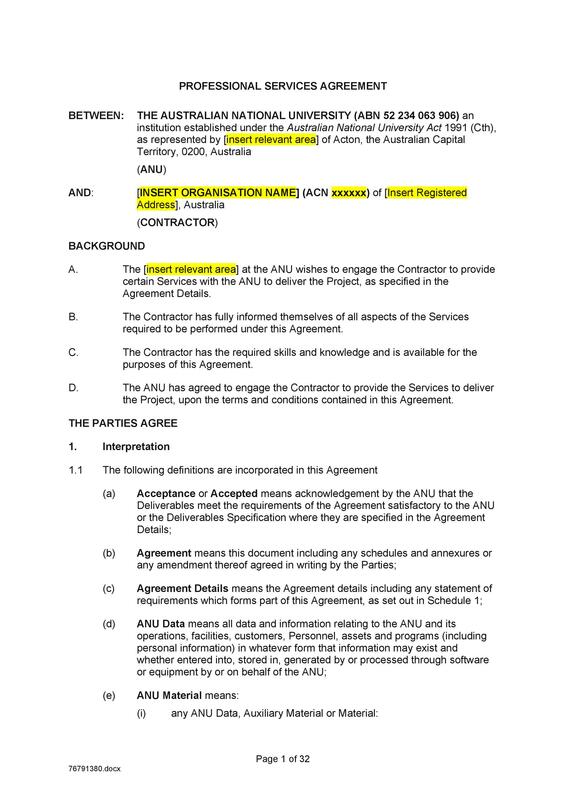 Go through the agreement. If possible, get an expert to take you through it. Do the terms meet your needs? In most cases, you realize that the terms might have been effective when you signed up for the services, but over the years, your business might have evolved and grown to the point where the terms are no longer sufficient. In this case, get in touch with your contractor and negotiate a better agreement, or if that is not possible, find a new contractor. It is good practice to have a reminder in place, where you review these three questions each and every year and review the terms of the service agreement you have in place with your service providers. 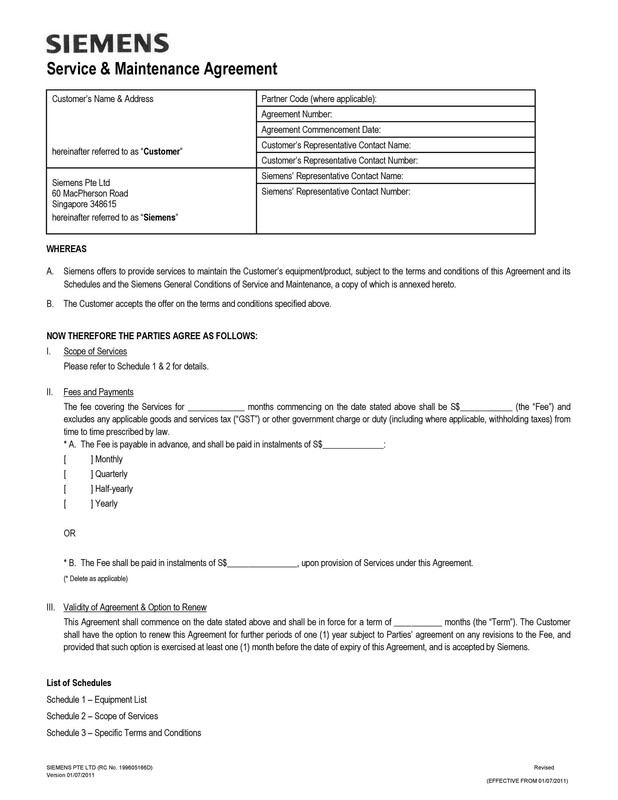 Who should prepare the service agreement? Most of the time, the service providers will have a standard service agreement templates part and parcel of the working engagement they have with their clients. To be precise, this is only supposed to be a starting point for you, especially if your business has a lot of demands. If you haven in-house counsel department, get in touch with them and let them go through it, proposing amendments that would be suitable for you. You can also have them include certain provisions that would highlight the priorities of your business that you would like the service provider to take into consideration. However, in case you do not have the luxury of such a team, or time, for that matter, you can as well use the service provider’s agreement as it is. 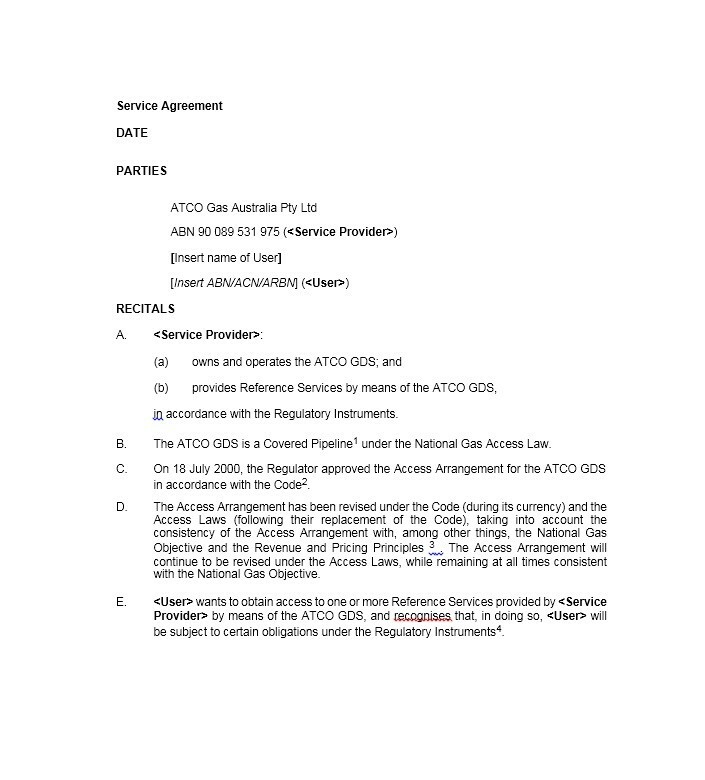 Your agreement with the service provider can be anywhere between a few pages to hundreds of pages. It all depends on the intent of both parties as they enter into the agreement. It should accurately outline the responsibilities of either of the parties. 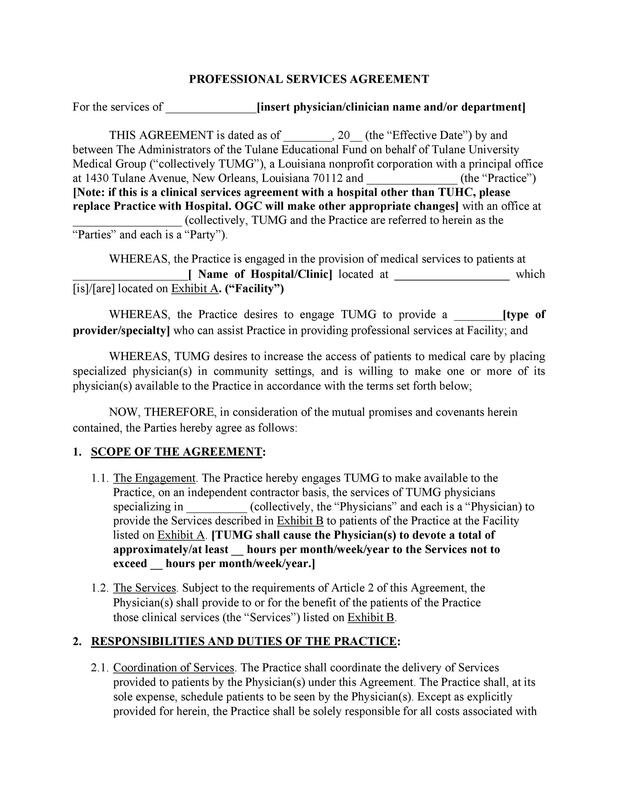 There should be an outline of how long this agreement is supposed to be in effect, the applications that are covered by this agreement, and the procedures through which the service levels will be monitored. 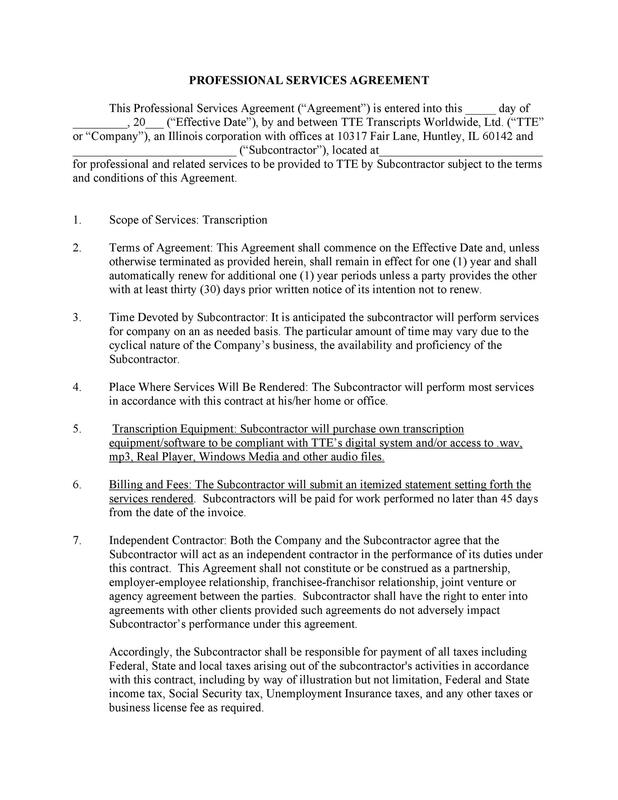 Indemnification is an important part of the agreement. The service provider has to agree to an acceptable degree of indemnification to the client, should there be a breach in the warranties they offer as they enter into the agreement. In most cases, as part of the indemnification, the service provider is liable for third party costs of litigation arising out of the breach of warranty or guarantees undersigned. 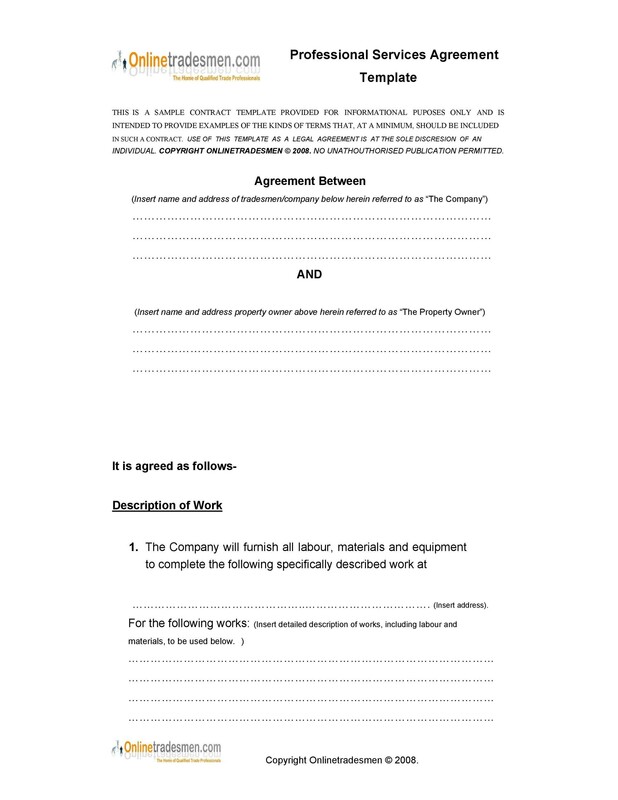 In case you are using the standard agreement that most companies have, there is a high chance that this clause will usually be absent in the agreement. What you should do, if possible, is to get an expert to draft this provision and present it to the service provider. They might request further negotiation before coming to terms with the new arrangement. Transferability of the SLA usually comes into play in the event that your service provider has merged with another company or has been sold to another. 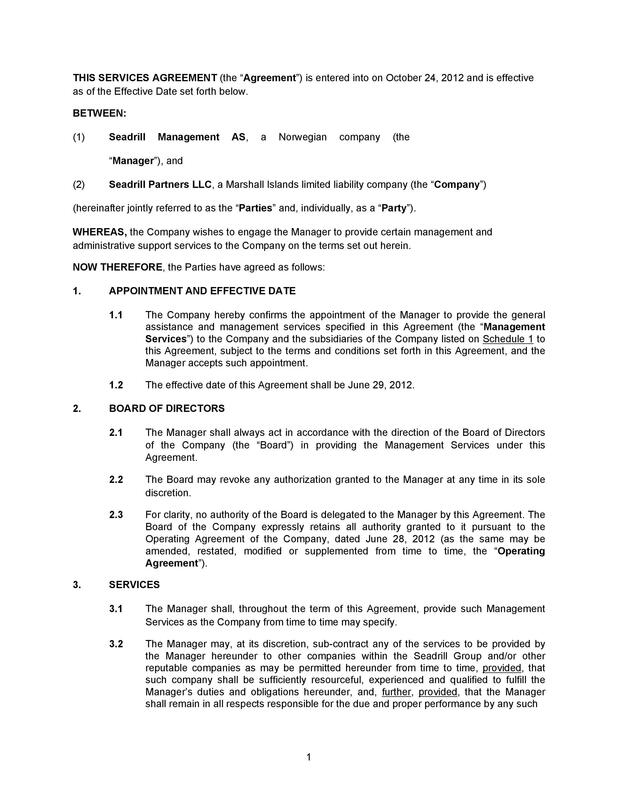 Assuming that the acquiring company or the new entity that forms after the merger intends to take up the obligations of the service provider, they will naturally assume the responsibilities and honor the previous arrangements. Sadly, this is not always the case all the time. Any agreement that has been entered into by one company as a legal entity ceases to exist when the company is no longer a legal entity. Therefore, the new company does not take up the responsibility of the old one. 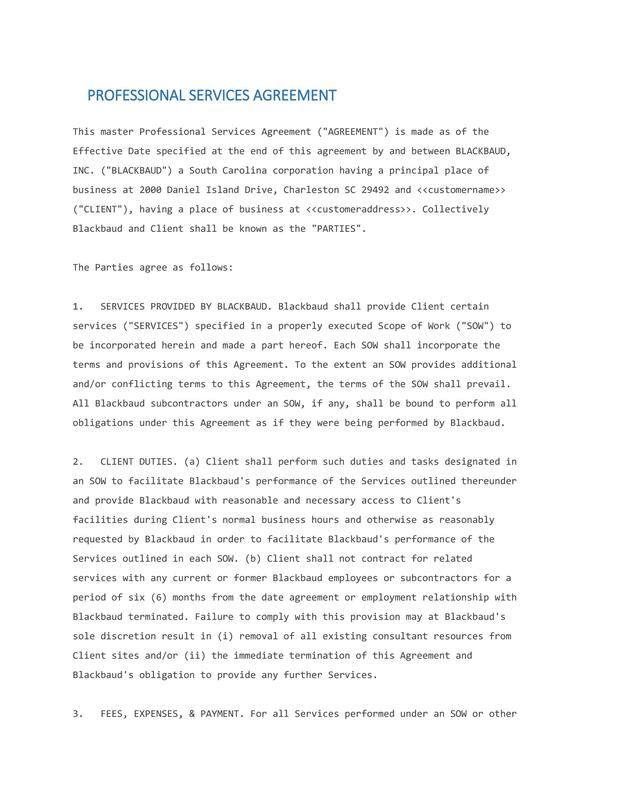 What happens in most cases is that you will need to renegotiate terms of a new service agreement. Since most companies do not wish to risk the wrath of rubbing their acquired clients the wrong way, they usually assume the existing agreements. Most companies assume the existing agreements up to the end of their term, upon which they initiate negotiations for new terms of agreement. In areas where service availability is critical, most providers will have regular reports available in different portals. From here, you can see how things are progressing, and whether the company has maintained the service levels that were promised, or where there were disruptions. You can also have your own mechanism in place where you monitor performance of the services rendered, and compare them with what is available from the contractor’s end. In case the services for which you have this agreement are critical, your business will be in danger in case any of the terms of the SLA are not being met. It is, therefore, a good idea for you to consider getting a management tool for your SLA or a monitoring service. 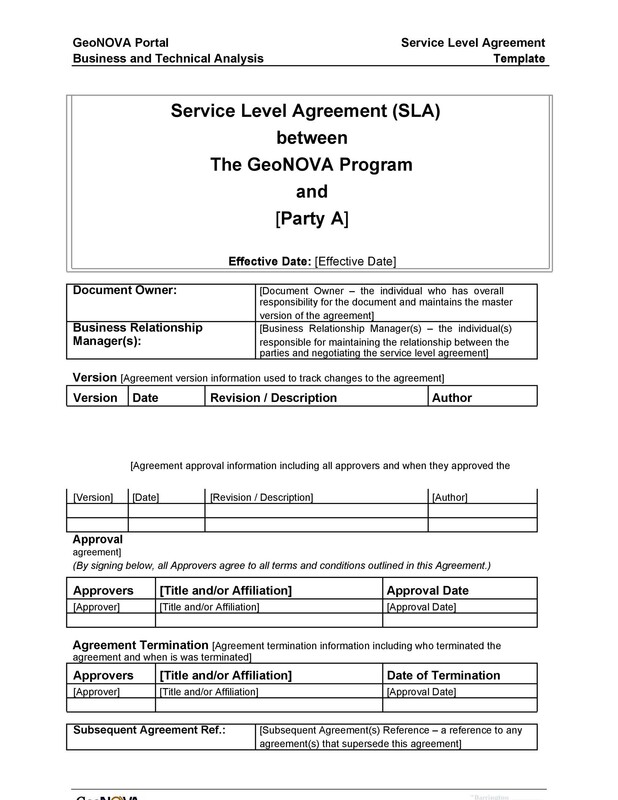 While service providers have their own means of making sure that the SLAs in place are being met, it is always wise to have a third party monitor the content of your service agreement template. This will give you real-time reports and updates so that you are actually getting value for the money you are paying. This might also open your eyes to better deals available elsewhere, which encourages you to seek better contracts and improve the performance of your business in the long run.